Snooze, an A.M eatery, has been a mover-and-shaker in the Denver Ballpark District, helping the homeless since its inception. Partially published in the Denver Voice, a newspaper for the homeless in Denver, Colorado, in May 2013. Tousled black hair and walking humbly with a slight hunch, Louise Noynay, 22, slipped to the back of the restaurant, ready to work the chef line for the Ballpark Snooze, on Park and Larimer in Downtown Denver. While he got ready to work the line in the back, crowds of customers showed up near the front of the veranda at Snooze restaurant as early as 6:30 am in the morning. 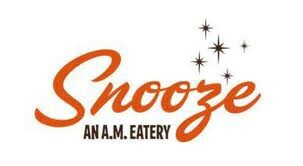 Branded as an A.M. eatery, Snooze offered breakfast and lunch foods with a high-energy setting and friendly service. Every staff of the venue came to work with a drive to serve because the restaurant offered more than just pancakes with syrups or vegetarian omelettes. Snooze served breakfast with a purpose. Noynay was just one of the six Urban Peak homeless youth who found support through Snooze Restaurant. Four years ago, after a serious fight with his mother, Noynay was thrown out of his own home. “I didn’t have a job, just out of school and had some issues with my high school diploma. I was just doing nothing at home,” said Noynay. Noynay would slump down on the corner of Park Avenue and Broadway, to wait for the bus. One night he asked another homeless man if there was a shelter nearby and Noynay was directed to the Denver Rescue Mission. Noynay was offered crack cocaine at the mission, although he declined, he was often preyed upon by drug dealers thereafter who would manipulate him to take the drug. “I know that if I had taken that drug, that would mean that I am giving up on living,” said Noynay. After that incident, a fellow at the Denver Rescue Mission told Noynay that he was too young to be out on the street, and directed him to Urban Peak, a center for homeless youth. “UP (Urban Peak) helped me, the staff sat down with me and did some goal settings. I told them that I wanted a job,” said Noynay. UP enrolled Noynay for a month long job training program. After several months, Noynay decided to sign up with the Workforce Investment Act (WIA) Program through UP. The WIA program offered to bridge all impoverished individuals with a company who would help rehabilitate those who were interested in changing their lives through vocational programs. Snooze was known in the Denver area as the Ben & Jerry’s of the A.M. eateries, because of its involvements with local non-profit organizations, namely The Homeless Coalition, Urban Peak, and Denver Rescue Mission. “Snooze has been working with Urban Peak since 6 years ago,” said Jonathan Waller, The Maestro — General Manager (GM) of Ballpark Snooze. Waller met the owners of Snooze, the Schlegel brothers (Jon and Adam) since he lived in San Diego, working at the Hyatt’s restaurant, Café Japengo. Jon Schlegel asked Waller to be the GM for the Ballpark Snooze, on Park and Larimer in Downtown Denver. Not long after Waller became The Maestro, he was appointed by Denver’s previous Mayor, John Hickenlooper, in 2009, and became one the board leaders in The Homeless Coalition to end the plight of homelessness in Denver. Each Snooze location has its own special niche, as for the Ballpark Snooze, homelessness was the biggest challenge that faced the local community. From the involvements that Snooze dedicated their services to, the restaurant was legendary for their contribution to the Homeless Coalition. Snooze became the only restaurant serving the coalition, and the second longest contributor. Snooze donated one percent of its total sales profits to local charities and schools, and served breakfasts foods for local organizational functions and fundraisers in Denver. “Snooze has donated to at least 10 schools and we create a budget per year to give to charity. We place a heart on philanthropy because that’s what makes us a leader and gets us ahead,” said Waller. Snooze did not advertise their restaurants, because all of its philanthropic and humanitarian efforts made each Snooze venues a step above the competitors. Snooze employees also participate in the effort and Shelly Landaal, one of the Ballpark Snooze servers, was the Volunteer Administrator for the venue. “It’s a part of our culture, and that’s how we acquire and retain our staff and customers. It’s just the right thing to do,” said Waller. There were three Urban Peakers working at Ballpark Snooze, and Noynay was one of the Snooze success stories. Not all of the Urban Peakers transitioned successfully from the WIA job training program, but there were some amazing transformations. Snooze’s culture emanated service, compassion, love and creativity. The venues boasted bright colored walls with the hussle and bussle of the restaurant somehow musical to the customer’s ears. “I would like to say ‘Thank You’ from the bottom of my heart. When I came here, I didn’t have any skills, but Snooze took the time to train me. I am weak minded and so clumsy, but they told me “you’re just fine the way you are,” said Noynay. Noynay was very confident with the skills that Snooze trained him to do, and he resided at the Rocky Mountain Transitional Housing. Noynay was also a student at the Community College of Denver majoring in Computer Science. He was thriving and would love to keep working at Snooze for as long as he can. “Snooze is very supportive of the community and just really is thinking what is best for everyone,” said Noynay, who had witnessed the Occupy Denver protesters form a resistance against the restaurant. “The Occupy Denver protesters have not seen Park Ave. at 5 am in the morning. The place is scary, there are drug dealing happening all the time, and violence. I think Snooze is just trying to get those folks to do better,” said Noynay. Ballpark Snooze was conveniently located amongst the struggling neighborhoods of Ballpark Denver, because the Schlegel Brothers wanted to provide an uplifting support through their restaurant. “Someone has to let them [the homeless] know that there is hope and that they can do better. And I think Snooze is trying to relay that message to them,” said Noynay. Writer, Adjunct Professor, Communication Specialist.